Today was SO cold, but I got a lot of things taken care of including: taking my new car to the dealership to get a couple little things fixed, seeing my best friend and her new baby, getting a pedi, working out(JILLIAN and Wii Fit), and whipping up a new cookie recipe! I had a friend over to do Jillian’s 30 Day Shred level 3, and to play with my new Wii Fit. It was hard. Ugh, I need to get some good cardio in tomorrow. My plan is to go to 6:30am Yoga at a new studio in Union Square, and go to the Bunker Hill Monument for a good cardio workout and practice for a race I’m going in February. After a nice busy day, I came home and had leftover split pea soup from the freezer, oh how I love having soups and stews in the freezer! But, I still REALLY hadn’t cooked today, and how I do love to be in the kitchen. So, I made peanut butter cookies- gluten free! Preheat the oven to 350F. Place the first four ingredients into a bowl and mix. 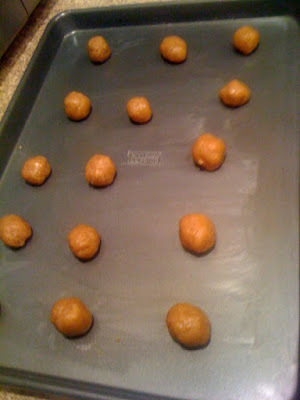 Make tablespoon size balls of dough and place them onto a greased cookie sheet. Cook for 10 minutes. 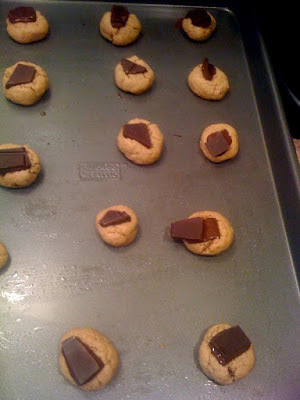 Take the cookies out of the oven, and place one chocolate chunk onto each cookie. Let cool.